The bite is back in vampire fiction as five of today's most provocative authors cast their irresistible spells on you... Follow a vampire hunter who can be as deadly as her prey. Meet a down-home southern girl who's found out, much to her chagrin, that vampires are her type. Feel the euphoria of fear in the shadow of a reluctant queen of the undead. Step closer to the hot-blooded edge of passion as a strange new mythology of the night is unveiled. Includes never-before-published stories featuring vampire hunter Anita Blake and everyone's favorite vampire-loving waitress, Sookie Stackhouse. 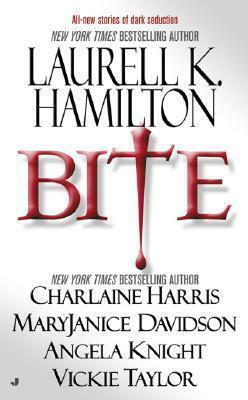 Laurell K. Hamilton is a full-time writer and the #1 New York Times bestselling author of the Anita Blake, Vampire Hunter series and the Merry Gentry series. She lives in a suburb of St. Louis with her family. Charlaine Harris is the #1 New York Times bestselling author of the Sookie Stackhouse fantasy/mystery series; the Aurora Teagarden, Harper Connelly, and Lily Bard mystery series; and the Midnight, Texas series. MaryJanice Davidson is the New York Times bestselling author of several books, including the Undead novels featuring Vampire Queen Betsy Taylor. With her husband, Anthony Alongi, she also writes a series featuring a teen weredragon named Jennifer Scales. MaryJanice lives in Minneapolis with her husband and two children and is currently working on her next book. Angela Knight is the New York Times bestselling author of the Mageverse novels and former newspaper journalist. Vickie Taylor is the national bestselling author of Carved in Stone, Flesh and Stone, and Legacy of Stone.